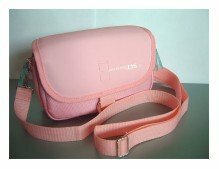 The first Nintendo DS carrying case in our round-up is the "NDS Nintendo DS Lite Carry Case Bag Pouch Holder". The name of the case might be quite a mouthful, but this neat little bag has plenty of great features for the discerning DS gamer. 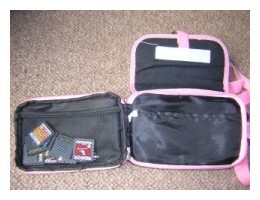 Available in black, white, blue and pink, this case has plenty of room for a DS or DS Lite and several accessories. 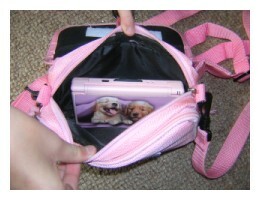 The "NDS Nintendo DS Lite Carry Case Bag Pouch Holder" – A name presumably gained from extensive use of a thesaurus. 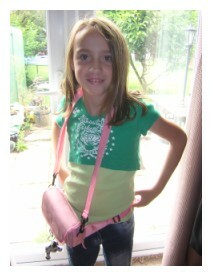 Looking a little like a handbag (especially the pink version) the case is divided into two zip-up sections. One section with a pocket designed to store the DS Lite, the other is for accessories or can be used to store an original DS. There's also an extra net bag style pocket for storing games, though we would have liked to see some proper DS game card holders rather than just a net bag. The net bag can hold lots of accessories, but we would have preferred some proper game-card holders. The accessory section is big enough for several more game cards, an AC adaptor or a car charger, or whatever else you need to carry around with your console. The interior of the bag is reasonably well lined and will protect against minor bumps and shunts. The accessory section – big enough for a spare DS. The case also comes with a shoulder strap and a strap that fastens around your waist keeping your valuable console securely attached to you while you travel. Very cute, the case isn't bad either. Overall this is a good case for travelling with your console or storing your DS and its accessories safely at home. It's a shame that there aren't proper pockets for storing games however.